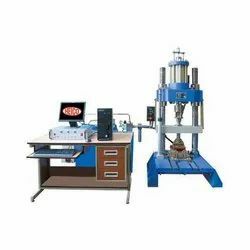 Leading Exporter of servo hydraulic universal fatigue testing machine, three axis fatigue testing machine, servo hydraulic dynamic -static actuator and servo controlled endurance testing machine for rubber pads from New Delhi. 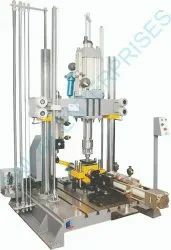 HI100 Series of Servo Hydraulic Universal Fatigue Testing systems are suitable for fatigue and static loading applications, are compact in design, easy to operate, sturdy loading units with enough clearance both horizontal and vertical, to suit the test requirements of fracture mechanics, fatigue loading & static loading applications. 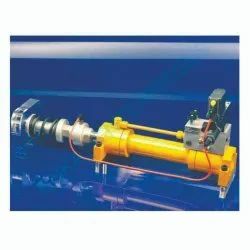 Servo Hydraulic Dynamic/Static Actuators are based on Servo Hydraulic Closed Loop principle and are extensively used for applying dynamic loads or displacements for different applications on structures, automobile components, Structural beams, Columns etc. It is a highly advanced system with fully computer controlled operation and also suitable for static loading applications. 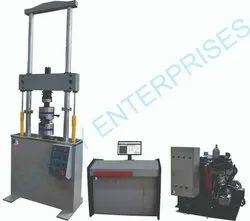 HEICO Cyclic/Static Rubber pad testing machines are state of the art machines based on Servo Controlled Closed Loop system. All the controls and data acquisition is through the computer. The system has a wave generator, cyclic & static, which forms a base to the compound signal. This signal is sent to PID controller. The machine response signal through base sensors that is displacement/load is also passed on to the PID controller. The difference in two signals actuates the torque motor of the servo valve thereby ensuring that the machine system follows the set path of the wave generator. Dwell time loading –unloading and recording of the reading is controlled through the software supplied as standard along with the system.